This is a Boston Cream Pie made in Connecticut. Is this against the law? Let’s hope not, because I don’t think I look good in stripes. I liked this recipe, I really did. People ate it, which is always a good sign. I’m going to make it again, but the next time, I’m going to do one thing different. I’m saying this up front. It’s not to turn you off, but I’m saying it because I believe recipes that interest you should always be made and then modified to be even better the next time you make it. So many people make a recipe and if it is not perfect the first time, they never make it again. I like to make things and then jot notes on what was good and what was not good and then think the recipe through and modify ingredients or cooking times so that it is even better the next time I make it. Most times my modifications are good ones. Sometimes not, but that’s the fun of cooking in my opinion. OK, so let me break this recipe down for you and tell you what was great and what I’m going to modify the next time I make it. The cake itself is really made in four parts: the pastry cream, the cake, the chocolate ganache frosting and the assembly. I loved making the pastry cream (my first time) and the taste was fantastic. Light and creamy with a hint of vanilla. The chocolate ganache frosting was also delicious. It was the standard ganache recipe where you use chocolate and heavy cream. What could be wrong with this combination? Assembly was really easy so that is always a plus. It was the cake. The yellow cake was good, but not great. It was a little too dense and not as flavorful as I would have liked. The next time I make this, I’m going to try to find a different yellow cake recipe, even if I have to go the Duncan Hines route (I can hear the gasps and screams now from my true foodie readers). If I can get the cake to be more moist and a little sweeter, this recipe goes from good to great. No doubt about it. I’m going to walk through the recipe as written and tell you what I used and what I did during my first attempt. Please make this cake. It’s worth the effort and I hope I haven’t talked you out of giving it a try…just modify. Did I just make a new saying? “Give it a try…just modify”. Who knew I could be this clever? FOR THE CAKE: Preheat oven to 350 degrees. 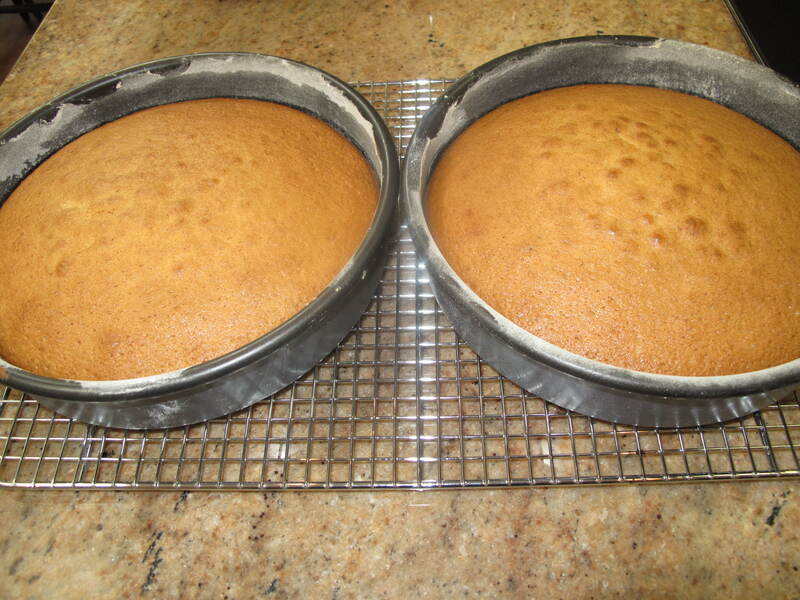 Oil and flour two 8-inch round cake pans. In a medium bowl, whisk together flour, baking powder, baking soda and salt. In a large bowl, whisk together the oil and sugar. 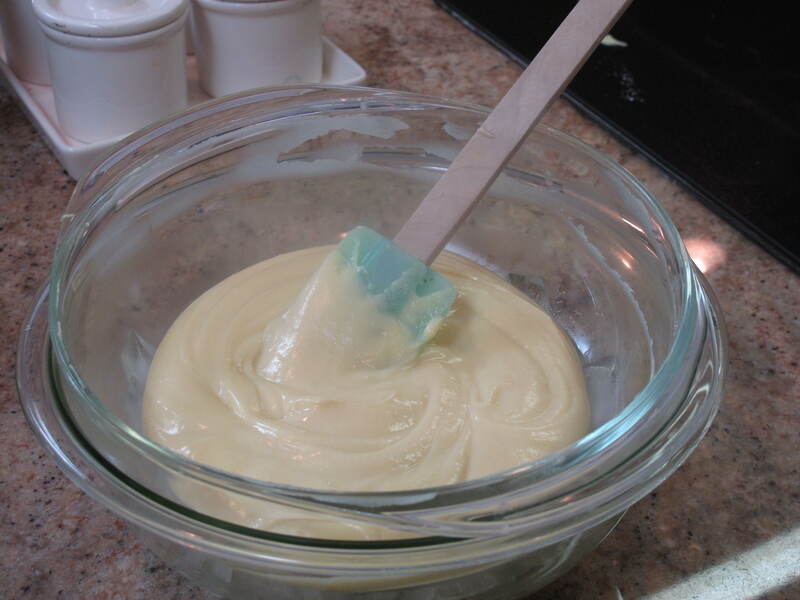 Whisk in eggs and vanilla. Alternately add in flour mixture and sour cream, beginning and ending with flour. Divide batter between pans. Bake for 30-35 minutes, until cakes pull away from the side of the pan. Cool in pans for 10 minutes. Transfer to a wire rack to cool completely. FOR THE PASTRY CREAM: In a large bowl, lightly beat the egg and yolks together. Add the sugar, a little at a time. Continue beating until mixture falls in ribbons when the beater is lifted, about 5 minutes. Mix in the flour. Begin to add the milk, a little at a time. Add a little milk and then let it mix well until you add a little more. The worst thing you can do is add too much and end up with scrambled eggs on your hands. Transfer the mixture to a saucepan. Boil gently over medium heat, cooking and whisking until the mixture thickens, 10 minutes. Strain the mixture though a fine sieve into a large bowl. Stir in the vanilla. Press plastic wrap over the surface. Cool for at least 1 hour. To chill cream quickly, place bowl over a bowl of ice and stir until cooled. 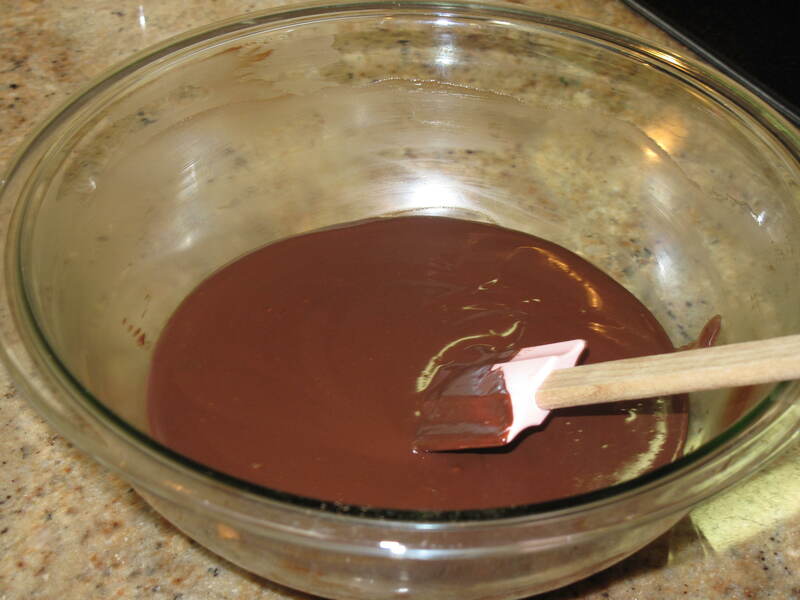 FOR THE CHOCOLATE TOPPING: Place chocolate in a medium bowl. Bring cream to a simmer in a small saucepan. Pour cream over chocolate and leave undisturbed 1 minute. Stir completely and allow to cool until it turns into a frosting consistency. It is really shiny and runny in the beginning. I place mine in the refrigerator and keep checking on it until it is the right consistency for frosting. ASSEMBLY: Slice off the domed top of one cake to level. Hollow out 1/2-inch depth with fingers, leaving a 1/2-inch border from the edge. 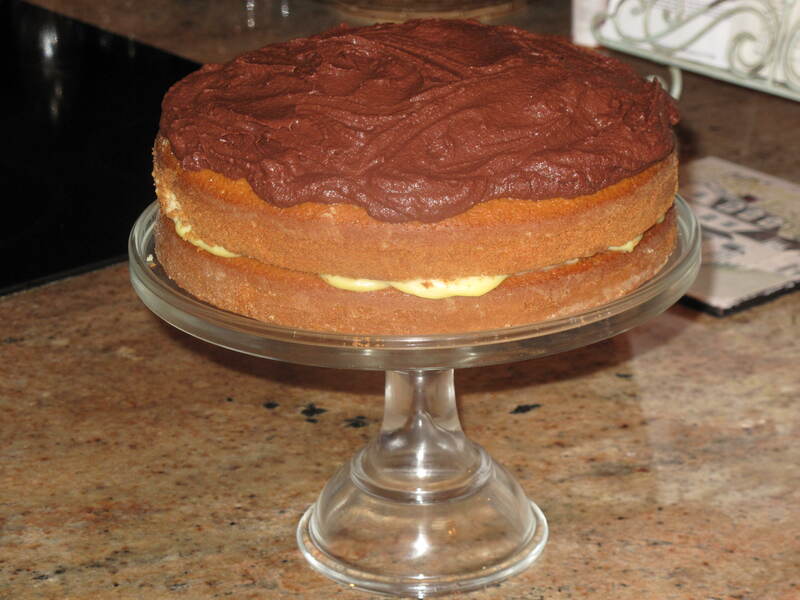 Place cake on a plate or cake stand. Fill with the pastry cream. It’s okay for cream to spill a bit over edges. Top with the second cake, dome side up. Swirl the chocolate topping over the cake. Chill until ready to serve. Don’t let my cake warning scare you on this. 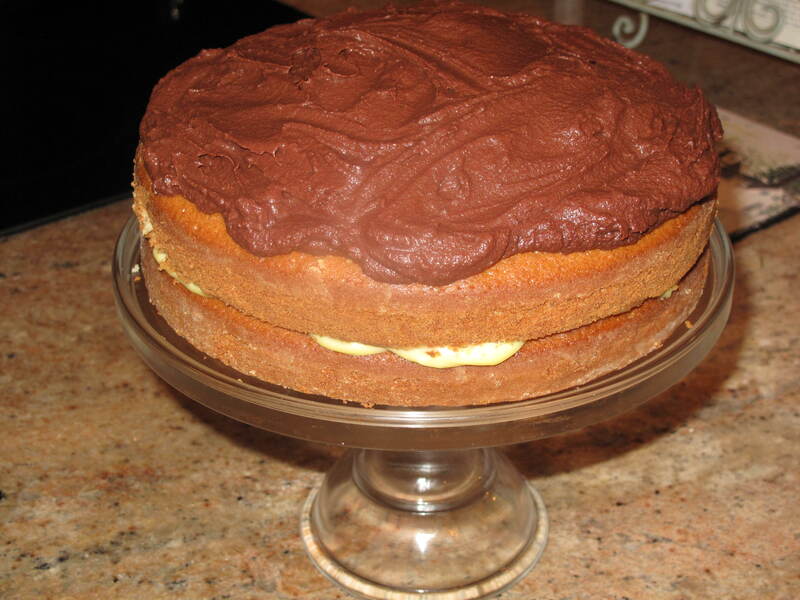 It is a great dessert….I mean who makes a Boston Cream Pie anymore? Surprise them all with this little creation. 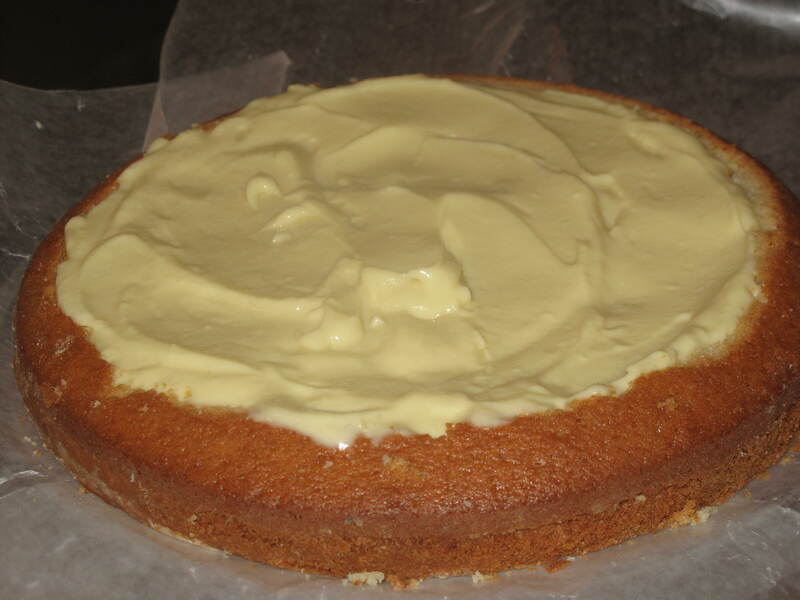 Again, I am going to do this cake again after I find another yellow cake recipe. It’s worth a repeat. Let us know how you liked it. What great dessert recipes do you have that you modified after your first try? This entry was posted in Food and tagged Acorns, Baking, Blog, Cooking, Dessert, Family, Food, Fun, Life, Lifestyle, Love, My Life, Photos, Recipes, Summer, Thoughts. Bookmark the permalink. ← A Picture Is Worth A Thousand Words – Winter Anyone? The cake looks delicious. But to be honest don’t think I can make it. The reason being is you know my baking talents and this does not fit in. Way too many steps. Thanks for your comment Carolkin. Would using the Duncan Hines change your mind? Come back and visit soon. Katherine would love that! Looks really good and yes, you’re very clever. Don’t let it go to your head! Hi. Thanks for your comment. I’ll be sitting here the rest of the day trying to one up that line about modifying. Come back and visit soon. I like the look of this…being British, my go to layer cake has always been a Victoria Sandwich; I’m definitely trying this one next time the cake stand feels lonely! Hi Mykie. Welcome to Acorns On Glen. I think you’ll like it just remember to make a better tasting yellow cake like I wrote. Other than that, very tasty. Come back and visit soon.